Bees are some of the hardest working creatures on the planet, and they're amazing team players who put the needs of the colony above those of individuals. I stood motionless in the apiary, where thousands of bees hummed around me in flight. The sun was hot on my back, and I could feel sweat trickling down my neck as I lifted a frame out of the hive into the daylight. It was heavier than I expected; the frame's tiny hexagons were packed full of honey, and they were blanketed with a mass of black and yellow bees milling about in the bright sun. "Relax your arms," chief beekeeper Julia Common told me. "The bees can sense your tension. Calm begets calm." I dropped my shoulders, and let out a long, steady sigh. "Good," Julia said. "Now let's take a look at our friends up close." I never expected to find myself here: in the middle of a swarm of buzzing insects, and holding a piece of a beehive - by choice - with my bare hands! I think my nine other team members were thinking the same thing. 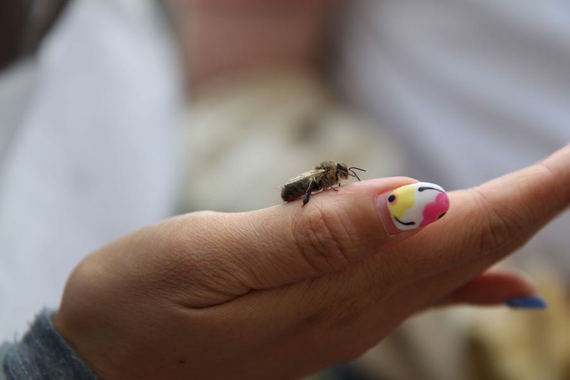 Some were curious and interested to know more, while many of us worried we could fall victim to a nasty sting. I'm pretty sure everyone was wondering why we were spending time with bees at all. We are a tech startup made up of software engineers, designers, and sales and marketing geeks. What do bees and beekeeping have to do with us? What could we possibly learn from this experience? The hive, like a good yoga practice, taught me to be "present in the moment." It turns out that technology often mimics nature. Honey bees have to cover long distances in multiple directions to harvest nectar and pollen from multiple flower patches, and scout bees are responsible not only for evaluating the quality of the food sources but also finding the quickest route from flower-to-flower. Similar to how bees optimize their flight paths, our company Routific has developed software that helps businesses plan and optimize delivery routes. Our software enables businesses to save on operating costs and reduce their carbon footprint by nearly 40%. From the moment our company was born, we've taken inspiration from honey bees. And it's not just the route optimization bit that caught our attention. Bees are some of the hardest working creatures on the planet, and they're amazing team players who put the needs of the colony above those of individuals. Mark Winston, author of the award-winning book Bee Time, put it this way: Bees "listen to each other, deeply, on all channels, using every mode of communicating we know of and probably some we're not yet aware of. Vision, odor, taste, hearing, touch, vibration, magnetism, electric fields - the input is constant and the interactions intense." And let's not forget the honeycomb. Constructed by thousands of bees, the honeycomb is an amazing display of space efficiency and architectural genius. "It is the venue upon which bees exchange information," Winston writes in his book, "communicating their experiences inside and outside the hive, creating awareness of their own community and the external environment." It's no coincidence that Routific's logo is made up of four perfectly shaped hexagons. Bees embody the foundation of collaboration and learning that characterizes our very own company culture. Our company, Routific, draws inspiration from bees. Everyone at Routific had a chance to hold a frame with their own two hands that day. We worked as a team, communicating our needs and even our fears aloud. Two team members smoked the beehive while another wedged the frame out of the box so it could be lifted out. We passed the frames from one person to another, relying on trust, teamwork and a shared experience. Afterwards, many of us described a peculiar mix of fear, excitement and awe. From the apiary, we could hear revving engines, people on the streets, and if you looked up, you could see the vintage-style neon sign from the famous Save on Meats diner across the way. 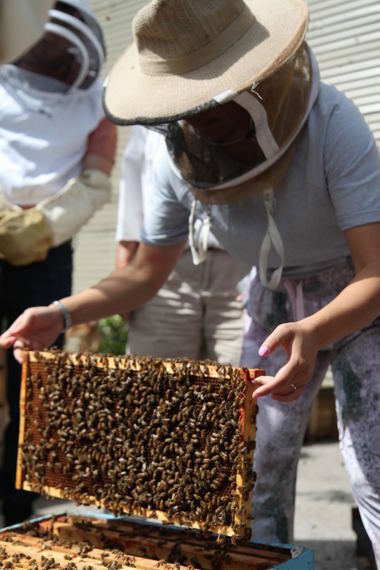 Our beekeeping workshop was hosted by an amazing non-profit, Hives for Humanity, on an urban farm in the middle of Vancouver's Downtown Eastside. All I could hear was the low hum of tens of thousands of bees around me. Despite all these distractions, when I held that frame in my hand, all that background noise - including my own fear and excitement - fell away. All I could hear was the low hum of tens of thousands of bees around me. From behind my beekeeping veil, time seemed to dribble to a gooey halt and I became engrossed in the bees that were crawling, floating, darting and taking flight in a seemingly frenetic yet purposeful way. This heightened awareness allowed me to experience an intense focus that rarely arises in me, a modern, multi-tasking human being. That day, I learned that bees complete tasks in order. They don't try to do everything at the same time. "Bees might not be intelligent, but they are single minded," writes Winston, author of Bee Time. "There is a presence to bees as they go about working that suggests complete absorption in the one task they are performing at that point in their life. ... As humans, we lack the focus and concentration required to perform tasks in the most efficient and effective manner. While bees do one thing at a time and perform that task with great precision and effectiveness." The hive, like a good yoga practice, taught me to be "present in the moment." Can we learn to better focus if we spend time with bees? We just need to find the courage to step inside an apiary and find out for ourselves. 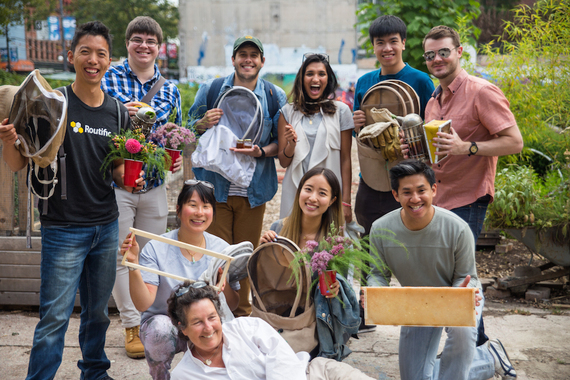 Team Routific after a morning of beekeeping at Hastings Urban Farm in Downtown Vancouver. World Honey Bee Day is on August 20, 2016, and is dedicated to honouring beekeeping and the incredible contribution honey bees make towards sustainable agriculture. Bees have experienced a drastic population decline around the world, but the good news is that we can all support pollinator health in our communities by planting gardens and supporting local beekeepers.